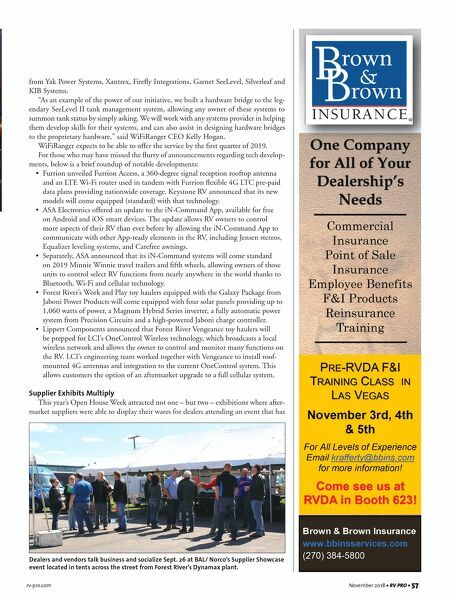 56 • RV PRO • November 2018 rv-pro.com O P E N H O U S E C O V E R A G E Chillin' & Grillin' Party in the Garden. Celebrity chef Kevin Roberts grilled up a culinary feast for guests, who then were treated to concerts by Stephanie Quayle and The Swon Brothers. On Sept. 25, a thunderous concert by Kid Rock at Forest River's Dynamax plant gave way to a torrential downpour about 20 minutes into the event, sending those who were listening outside scrambling for cover. Bu t t h e l i g h t - ning and heavy rain couldn't dampen the enthusiasm of those squeezed inside the building and even those seeking shelter under a nearby tent cheered as the music continued and the rain pounded down. Meanwhile, at the Thor display, the manufacturer chose to end its festivities held under a big tent pitched at the RV/MH Hall of Fame early that evening to avoid any risk to its dealer patrons. 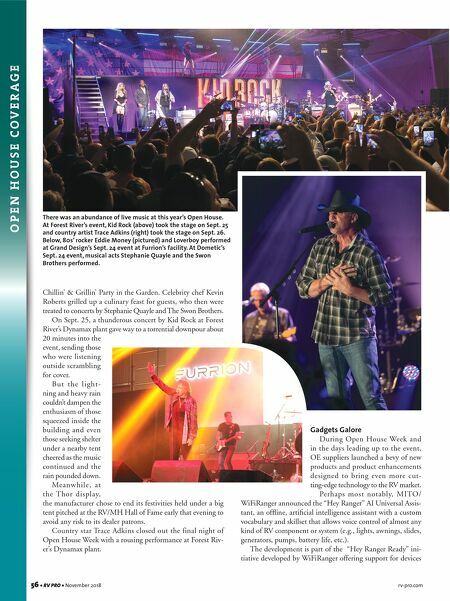 Country star Trace Adkins closed out the final night of Open House Week with a rousing performance at Forest Riv- er's Dynamax plant. Gadgets Galore During Open House Week and in the days leading up to the event, OE suppliers launched a bevy of new products and product enhancements designed to bring even more cut- ting-edge technology to the RV market. Perhaps most notably, MITO/ WiFiRanger announced the "Hey Ranger" AI Universal Assis- tant, an offline, artificial intelligence assistant with a custom vocabulary and skillset that allows voice control of almost any kind of RV component or system (e.g., lights, awnings, slides, generators, pumps, battery life, etc.). The development is part of the "Hey Ranger Ready" ini- tiative developed by WiFiRanger offering support for devices There was an abundance of live music at this year's Open House. At Forest River's event, Kid Rock (above) took the stage on Sept. 25 and country artist Trace Adkins (right) took the stage on Sept. 26. Below, 80s' rocker Eddie Money (pictured) and Loverboy performed at Grand Design's Sept. 24 event at Furrion's facility. At Dometic's Sept. 24 event, musical acts Stephanie Quayle and the Swon Brothers performed.